That’s right folks, the roundup came a day early this week! As a marketer, I tend to have strong opinions when it comes to graphics. So today I’d like to discuss my positive opinions of fonts. MAN do I love fonts. Nerdy? I know. But that will not stop me from proclaiming affection! Sure there are plenty of horrible fonts out there (Papyrus, anyone? ), but I’d rather talk about the ones that bring a smile to my face! 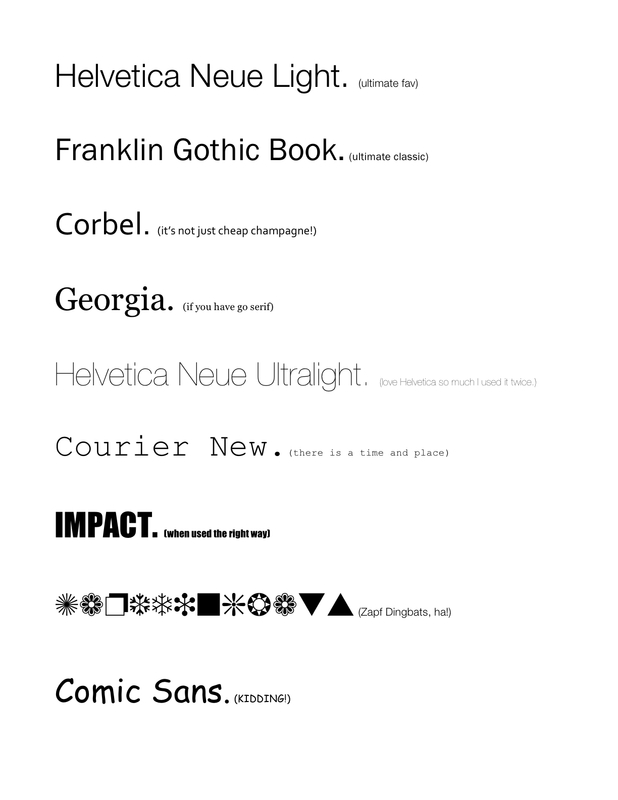 Drumroll please…..I present, fonts I LOVE. Spread the love by sharing your favs in the comments section below! I really like these fonts! And I generally prefer the look of sans serif fonts, too. To my eyes, they make documents more modern-looking and up-to-date. Alas, our “corporate standard” is still Times New Roman and after the New York Times article claiming that Baskerville is the most believable font (http://www.helpeverybodyeveryday.com/proposal-development/1392-which-font-to-use), I decided that TNR might be more convincing than Helvetica or Arial, so I should probably not lobby for a change in the corporate standard. Ha – thanks for reading, Trish! I like a sans serif for headings and subheads, but agree that it’s common for most firms to use a more traditional serif for body text (TNR, Baskerville, etc). The firm I work for uses Adobe Garamond Pro for body copy.